"Sure. We'll leave as soon as possible. And Cariharn ... you don't need to eat if you want to.." Artemis said, noticing Cariharn's nearly invisible wince, and aimed for the carcass's stomach, taking a few bites, before spreading her wings and getting ready to go. But her senses warned her about a presence nearby. "Uh.. guys, mind staying here for a while? I need to check something out." Hoping that none of them would follow her, she stalked out of the clearing, towards that presence her senses alerted her about. Then she spotted him. He was another IceWing, and was a little shorter than her. The edges of his wings were sharp; it would be deadly against opponents. She spread her wings, ready to evade if necessary. Cariharn sighed in relief when Artemis had caught wind of her distaste for blood. It was strange how the dragoness had managed to stay alive when she hated getting even her claws dirty. But then again, she had her ways. Then Artemis looked towards the trees and Cari followed her stare and soon enough, found a tinge of blue between the greenery. How interesting, now there were three IceWings in a place far from their own territory. Just then, another dragon made its appearance,a NightWing whom Draco seemed to be familiar with. "It appears we have two new guests. Pleasure to meet you both," she greeted, both the hidden IceWing and the NightWing who at least didn't hide their own presence. Kenshin had happened upon quite a number of dragons. 2 IceWings, a FireWing and a NightWing. He felt the presence of another somewhere there, but he brushed it off. He always had that feeling anyways, to the point he had grown used to the feeling of another dragon residing somewhere. Though, this time it was quite apparent it was not the usual feeling he had. Instead, it felt a little chilly. Then again, there were two IceWings in the area. Why wouldn't it be cold? The drake went forth, deciding to greet this group of dragons. "Hello," he said, his low voice booming silently. Artemise was waiting for the mysterious male's reply; however, her attention was pulled back to the dragons she'd met. She could detect two newcomers; a NightWing, and another one. Judging from his scent, he was a hybrid. Then she heard his voice: it was low, but carried ... experience? Forgetting about the male in front of her, she hurriedly returned to her "friends", standing in front protectively. She realised how stupid her actions were, though; she may have gone through plenty of training, but the hybrid, like his scent, carried an air of experience, and the NightWing slightly creepy. Watching them cautiously, she dipped her head in response to his hello. 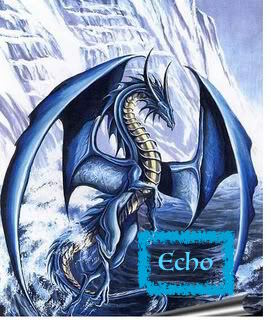 Echo stepped forwards from the shadows and out into the light, the light bouncing off of his scales. "Why, hello, dragons. Why are you guys here?" He noticed one of them was Artemise, and shook his head. "Did you get lost?" He chuckled, realising the defensive stance Artemise was in. "I thought a group of random dragons together seemed quite weird... So I chose to follow you for some time." He flung some spikes from his tail in boredom. He backed back into the shadows, and headed off into a forest in a random direction. His stomach growled, he realized he was hungry. He quickly crouched low, sweeping the ground for prey. Suddenly, a deer bounced out of a bush to his right. Startled, he slammed an ice spike from his tail right into the deer, killing it. Echo exhaled, now knowing it was a deer. Well, he thought, I might as well eat it since I caught it. He picked up the deer thoughtfully, settled down by a big tree, and started to chew. Cariharn looked towards Echo who had temporarily revealed himself and, in a way, made an introduction. She was about to ask for his name before he retreated back into the shadows, ending her attempt right there. The dragoness shrugged it off and turned to Ender, as she had yet to know his name. She supposed she had seen him a couple times before though. "Well then, could I have your name please, sir?" she asked the NightWing. I'm starting to feel crowded now. Ender 2 whispered when more dragons appeared from the forest. And one of the icewings asked me for my name. "Well i forgot about that, sorry. I am Ender, one of the few dragons with a split personality and one of Draco's oldest friends, and it's nice to meet you all." I introduced myself to the group, and then one of the two Icewings i seen ran straight for the main part of the group. "Wow, one of the two dragons i seen just ran in. This is going to end well after this, won't it?" I said to the Icewing, but Draco was starting to get worried from the look on his face. ow i know this will end great up for me. "Split personality?" Artemise peered at him. "You look kind of familiar. Ender's your name, right?" After a while of staring, it hit her. "You're the NightWing I met before! Remember the hatchling?" She grinned at him now, folding her wings. We've a very merry party over here ... By the way, I'm supposed to be getting back home now, but I suppose that can wait. Do you all want to explore? Enter other territories? I haven't finished exploring the FireWing territory yet." The ice dragoness looked at everyone, waiting for an answer expectantly; meanwhile, her gaze wandered around, and she frowned in dislike. Forests. Always so wet. I sighed in relief after hearing Artemis' comment, until she mentioned exploring. Then Ender was surprised for a moment, and then put a huge grin on his face, which could only mean one thing. "No, we are not going back there. I was over there 3 times already and almost died every single time." I scolded Ender, but it was no use because it wasn't my good old friend that was playing as him. "Aw come on. i only want to show the other what we're talking about!" Ender 2 mimicked my friends voice, which surprised me as well as shock me because i NEVER knew him very well, so this was new to me. "Since when did you mimic voices like that Ender 2?" i asked him, and he smiled again. "Ever since we were your friend. But please, for old times sake?" He asked me in the most polite voice possible, and now i was even more terrified of him. "Just stop doing that, let's see what the others think." I told him to stop and waited for the others response. After a moment of consideration and mental battles, she finally came to a conclusion. "I'll come with... err, Ender's split personality, or whatever his name is. I've never been with a split personality before; I want to know how it's like. But no tricks," she added. She just had a feeling Ender's double was a trickster, and she had enough of them. But what about the others? Once again, she looked around at her newly found friends, and all of them looked like they were deep in thought, so Artemise decided to just admire a small bird sitting on a branch; its glossy blue feathers, which had a golden tip and silver flecks, shone in the sunlight; she was suddenly reminded of her own bird. She would lock him in a cage for weeks. Still, she hoped that he hadn't gotten himself eaten; it had nearly happened once. A dragon who particularly liked birds for breakfast had targeted the poor yellow bird; thank goodness Artemise was close by, and saved her bird just in time. "Aw, you don't trust me? that's just sad." Ender 2 said, which let the both me and Draco facepalm as soon as those words left our mouth. Keep it up and i'll get you a halo. I quietly replied inside our mind, but he beat me to it with a shiny halo on his head right then and there. You were saying? He said with a huge smirk on his face, while Draco on the other hand wasn't too happy. "Like i said last time we met, you are not going to fool me. But i'll let this one slide, only if the others agree with you." Draco replied to the comment he spit out. One down, 2 or more to go. a faint whisper let his mouth following a smile soon after. Kenshin looked over at Ender with a look of interest. He had never met someone with a split personality, other than himself of course. He flinched when he felt a voice in his head speak up. "Darn it," he muttered under his breath as he looked away quickly. "You know, you could let me talk with this...Ender," Mahwus whispered in Kenshin's mind. "No! You're just going to kill everyone, Mahwus. I have been with you for more than 500 years. Don't think I don't know your true self,"
"You wound me, Kenshin. But really, you're trying not to remember aren't you?" "Oh shut it. Go back where you belong." Kenshin then turned back to the group with a strained smile. He had spent too long talking to the personality he didn't want any memory of. He cleared his throat. "I wouldn't mind going with you, Ender. Wherever you're going," he spoke, trying to regain control of his conscience. Cariharn smiled a little at Kenshin's words and agreed as well. She supposed she had met Ender at one point, but she figured she had known the NightWing well enough. Perhaps she could indulge in some psychological research while in the presence of a split personality. "If you wouldn't mind, I will go as well," she said. She felt like Kenshin was struggling with something in the back of her mind, but it wasn't her nature to poke into something others were hiding. It could lead to their disapproval. When the other agreed to go with him, his smile partially transferred to our mouth since his smile was something so large that it is the stuff of nightmares. "Well then, i believe i win Draco. While the place we're going is close to close by, so we can walk over to there." Ender 2 gleefully said to the group, getting ready for the adventure. Now i think you had enough for one time, let me talk for a moment. I asked my split, yet he stared at me like i was going to die soon as he backed away to let me take the spotlight. "Now that's out of the way, i was thinking of going in pairs to get to know each other better. I would like to take the new dragon, since we have taken an interest in him after losing himself in thought." I replied to the group, while Draco just hung his head in failure from everyone picking the option to go with me. May the Eternal flame have mercy upon us when we find the temple of darkness. I thought to myself, hoping that the place we are going to won't be like when i last went over there. Artemise beamed at the prospect of another adventure; however, her expression turned crestfallen when Ender chose someone that she was going to pick. "Ender, can I please go with him?" She nodded in the direction of Kenshin, hoping that Ender would let her go with the shorter hybrid. If not... well, too bad for her, then. The dragoness edged towards Cariharn, and it was obvious that she was going to pick the IceWing if Ender refused to let her go with Kenshin. Glancing up at the sky, she suddenly saw a small patch of yellow descending towards her; it was Gilbird. He landed on her head and settled between her two horns, chirping happily. Where have you gone? she demanded. Somewhere, the little yellow bird replied cheekily. Oh, damn it. Artemise sent a blast of her annoyance down the telepathy line. Kenshin looked at the two dragons with a look of interest. He grimaced slightly, realising that they had noticed his slight mental conflict. The elder dragon then took in even breaths to clear his head and again trick himself into seeing a perfect world. Mahwus would be too dangerous especially in this environment. He could only hope that the dragons don't ask him about his past or he would have to push his concentration even further and that would tire him out greatly. Cariharn observed the two dragons, both having developed an interest in Kenshin for some reason. She would love to pair up with the elderly drake as she too had an interest but she figured she would step aside and not create more confusion. The IceWing sat down and waited patiently for things to come together. Despite the decision of the pairs they come to, she figured she would be fine with whatever seemed best. Do you think she known what he is hiding? Ender 2 asked me with a confused look on his face, which i shook my head no to reply to him. You know that only dragons who are trained with their split can see other dragons with one or more of these splits. But i do feel something 'off' about this one though, don't you? I then questioned the two of us, and then decided to do one thing that would change our plans a little bit. "Okay, you can pair up. I do have a partner already, so that leaves Draco and the other Icewing." I ended the argument before it began, and left Draco surprised at what just happened. Artemise dipped her head gratefully. She had taken an interest in the rogue, and wasn't going to let someone else partner with him without a fight, but she had been hoping that she could avoid any conflicts. Thank goodness for Ender's decision. "Thank you, Ender," she said, and when she raised her head, she was smiling again. "Come on, guys, hurry up and choose your partners before the fine weather is ruined by rain." In jungles and such, she couldn't tell when it was going to rain, for it was already so wet and a little more of dampness in the air didn't make any difference for her. She trotted over to Kenshin and tugged at his tail with her teeth gently, careful not to leave any scratch marks. "Shall we go?" Letting go of his tail, she looked at him expectantly, and then something struck her as odd. The rogue's face looked ... strained. Sweeping her gaze across his body, she found no recent injuries. What was wrong? Mental injury? The ice dragoness nearly let out a snort at that thought, and had to pretend that she was coughing, but real coughs racked her body, and some blood stained the ground. Her injury was acting up again. Why now, of all times? Hurriedly stepping onto the red patch on the ground, she blanked her face and tried to look like she hadn't coughed up blood. There was red spots on her lips that gave her away, though, but she didn't realise it. Kenshin looked over at Artemise, looking her over so that he would remember how she looked like. Old age do things to the brain, making it forget certain things, after all. He was about to confirm their pairing up when she started coughing. Unfortunately, his subconscious mind prevented him from seeing the blood that was spilt. Instead, the grey drake only saw splodges of water on the ground. For a moment though, a hint of red flashed before Kenshin's eyes before disappearing. "Fool! You're letting your eyes deceive you again! Why won't let me in?! "Mahwus, please. I do not see any blood. If I did, you would have been in control a few minutes ago"
"So...what you're saying is, that I just have to disrupt your flawless reality? Well, I'll do just that Have fun, imagining, Kenshin"
Cariharn looked around, so Artemise would be pairing with Kenshin. Now, she just needed a partner. However, she wasn't sure who in particular. Ender had stated that he had a partner already, so that left the FireWing, whose name was, Draco? She supposed. "So, Draco. That's your name I hope?" she began with a polite smile. She then heard some coughing from Artemise and looked over and felt a bit taken aback when she saw a bit of red on Artemise's mouth. She didn't...did she? Cari opened her mouth to speak but closed it shortly, unsure if she should poke into her business, as it didn't seem as if the other IceWing wanted to talk about it. Huh, i can't believe not only Ender 2 gave up on something, but also agreed with him. But the question i need to ask myself is why did he want him as a partner? I thought to meself for a moment before i heard the Icewing ask me if my name was Draco. "Yes, that is correct. Which if you were going to ask me if i would be your partner, which i would love to." I replied to her to both of her questions, one before she asked since we were the only ones that needed a partner. Then, i noticed that Artemis had some blood on her lip, but i didn't reveal that i saw this and hid my emotions to not make a scene, yet i was worried if this trip to 'over there' would make this a bigger problem. Or i could be worrying again, i don't really know most of the time.